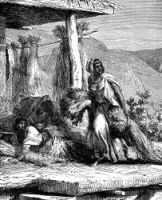 Rahab was a celebrated woman of Jericho, who received the spies sent by Joshua to spy out the land. She hid them in her house from the pursuit of her countrymen and was saved with all her family when the Israelites sacked the city. Rahab became the wife of Salmon and the ancestress of the Messiah. These illustrations of Rahab are from my collection of old books. Feel free to use these pictures of Rahab in your projects. Click on the Rahab drawings below to see more details about saving a free image of Rahab or about purchasing the Rahab images at a higher resolution.